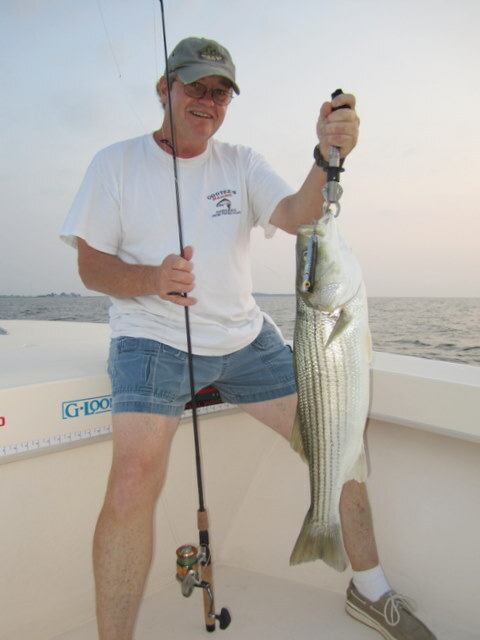 July has brought – for the most part – some very good shallow water, topwater fishing for rockfish, as well as limits of nice-size flounder. 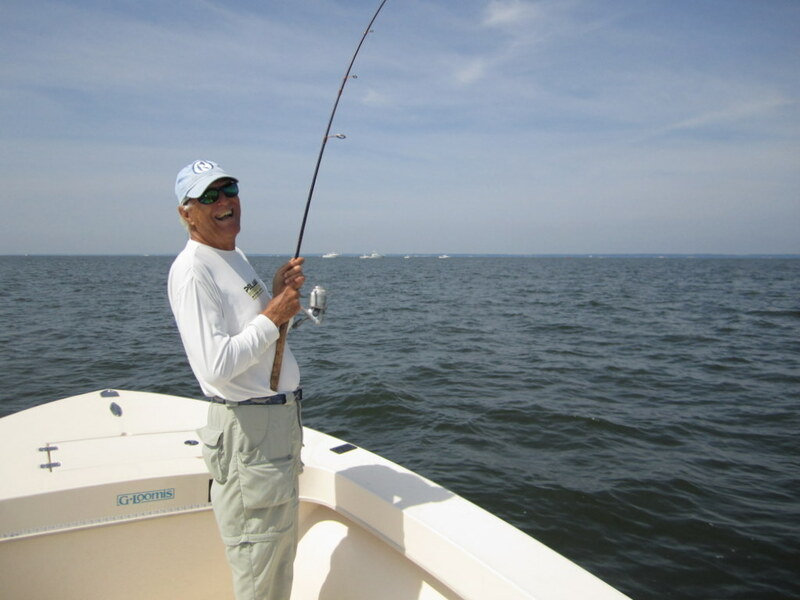 While the larger bluefish seem to have departed the lower portion of Tangier Sound, most of my anglers have been more than willing to spend the late-morning hours jigging Li’l Jimy bucktails and Berkley Gulp! tipped lead-heads for flounder that have averaged 18 to 23 inches. On Monday, July 11 I spent the day fishing with Scott Evander and Hovik Taymoorian, D.O., two great guys who last fished with me during a spring flats excursion. Scott and Hovic are great fishing companions, because they have just a super time no matter what the day brings. On this day it brought the wind. Our shallow water striper spot was muddy, so we decided to make an attempt at flounder. As we traveled to the mid-bay flounder hole, the waves were an adventure, but we felt completely safe in my Jones Brothers Cape Fisherman 20. When we arrived, the wind and tide were both heading north, so, in order to keep our jigs on the bottom I had to point the bow of the JB into the wind and use just enough throttle to maintain our position over productive bottom – a ‘power-drift’, if you will. It really worked okay; that is, until a flounder was hooked and then someone had to grab the net. As all hands were busy enough beforehand, this added an additional level of excitement to the entire process. We took turns with the net, and never lost a fish, but this was ‘extreme flounder fishing’ to say the least. While the fishing was by no means hot, we did salvage a breezy day and the guys were able to take home a few nice flounder for the table. 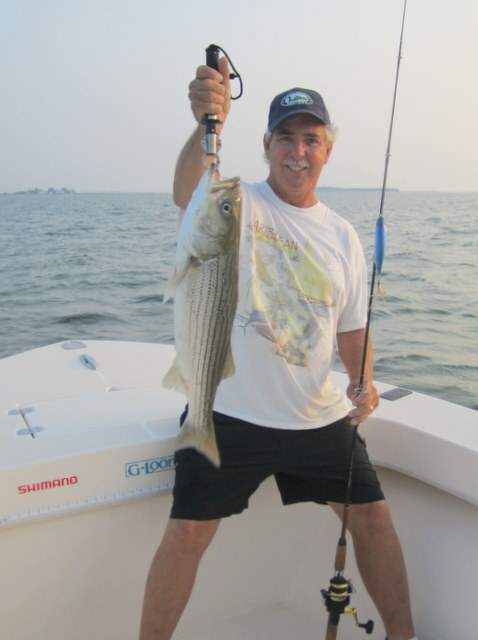 Friday, July 15 brought Bob Gray and Mike Schmidt to Crisfield for their first try at Tangier Sound shallow water rockfish. The rock did not disappoint. 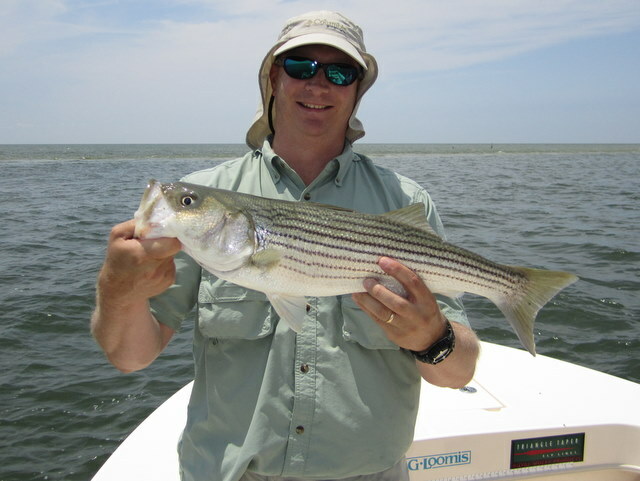 For the better part of an hour, both Bob and Mike enjoyed explosive strikes from stripers up to 28 inches. Both left impressed with the topwater theatrics and drag-screaming runs of a good-sized striper caught in shallow water. The flounder bite was next. The jigging technique that I use was somewhat new to both Bob and Mike, and while the fish made us work a bit, we did manage a limit a piece for both anglers. In all, eleven legal-size flounder were boated; all beautiful fish ranging in size from 18 to 23 inches. Mike even added a twist that left me impressed. His son Mike has developed a fish attractant product called the Fish Bomb. Mike Sr. made a believer out of me as he was top rod for the day, all the while spraying a shot of the juice onto his bucktail jig before lowering it into the water. The flounder really seemed to love it! Wednesday, July 20 brought two local boys to my boat in Guy Griffin and Ron Perdue. You know, it hasn’t always been easy attracting native eastern shore folk to my business; since everyone down this way has access to a boat, plus they are all very good fishermen in their own right. Guy and Ron were no exception. The two really put on a show as they turned in one of the best topwater mornings of the summer. Over twenty rockfish crashed, cart-wheeled and smacked their Storm and Stillwater poppers all over the shallows of lower Tangier Sound. Beautiful, fat stripers to 28 inches helped convince the guys that they need to add a surface popper to their rockfish arsenal. Guy and Ron didn’t miss a beat adapting to the new method. After the morning bite slowed, both were anxious to get at the flounder. Fishing two areas that have been hot of late, Guy and Ron managed a limit a piece of thick-bodied flounder to 22 inches, and they boated nine total over 18 inches. Some nice fillets for the table were their reward for carefully releasing every single rockfish to fight another day. On Tuesday, July 5 I met Mel(Skip) Bertrand and his grandson Tyler Wheeler at the Somers Cove Marina boat ramp for a six-hour trip for some rockfish and flounder. Conditions for an early topwater bite were good and I was hoping the fish would put on a show, since Skip and Tyler don’t often fish for rock this way. The first fish came out of nowhere and exploded on Skip’s Storm Chug Bug about halfway back to the boat. 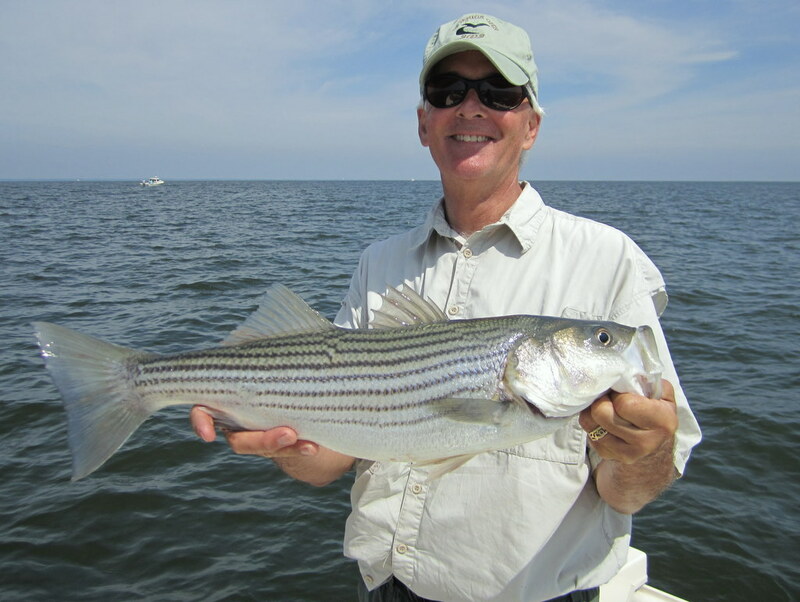 When a 26-inch striper hit’s a popper in four-feet of water much of the fight is on top, and this fish didn’t stray from the norm. After a game fight Skip landed and promptly released the fat, healthy rockfish. It wasn’t long before an explosion of water caused Tyler’s popper to disappear and Tyler was hanging on for dear life with his G. Loomis IMX rod bent double. Tyler did a super job of keeping the mid-twenties fish out of some nearby structure and boated the striper in short order. Game on! For about thirty minutes blow-ups were coming on a regular basis and then it just quit! Though short-lived, the explosive strikes and tough battles more than justified the early wake-up call. Now it was flounder time. I eased the Jones Brothers into position for our first drift and briefly explained the jigging technique to Skip and Tyler. It wasn’t long before the first rod was doubled-over with a heavy fish. Using Li’l Jimy bucktails by Specialized Baits, or simply a plain 3/4 oz. jig-head with a Berkley Gulp! Swimming Mullet we boated several nice flounder to 22-inches before the action shut down. While we didn’t get our limit this day, it was fun watching Skip and Tyler perfect a new (for them) flounder technique that they can try elsewhere. Saturday, July 9 was practically an encore performance of Tuesday’s trip. Only this day it was Justin Matoska and Colin Maxfield who were at the working end of the G. Loomis spinning rods. The rest of the cast was the same. Rockfish from 22″ to 27″ crashed the topwater offerings of Justin and Colin for the better part of an hour until the action subsided. Once again, Storm Rattlin’ Saltwater Chug Bugs were the hot popper. A couple of things that I like about the Chug Bug is they pop easily (and throw a lot of spray in the process), cast like a bullet, and the Perma steel hooks are super-sharp and resist rust. After the topwater bite died, Justin and Colin broke-out the fly outfits and began to cast chartreuse and white Clouser Minnows over some shallow structure. Both are fairly new to saltwater fly fishing but after a few tips Justin and Colin were easily reaching the fifty foot range with their casts. The wind was a definite liability this day and the guys did well casting the sink-tips into a stiff 15 K breeze. 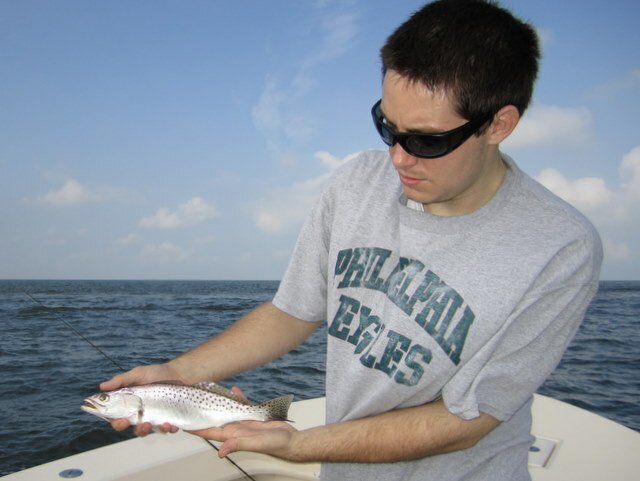 While the stripers didn’t cooperate, Colin managed his very first saltwater fish on fly, a colorful speckled trout! When the wind let-up enough to drift for flounder we took a short run and fell in line with several other boats already on site. While the catching was less than stellar, Justin and Colin did manage two keepers of 18 and 21 inches. All-in-all, another pleasant day on the bay with, I believe, two new converts to the world of saltwater fly fishing. Keep at it guys! Jacob breaks the ice with a big perch! 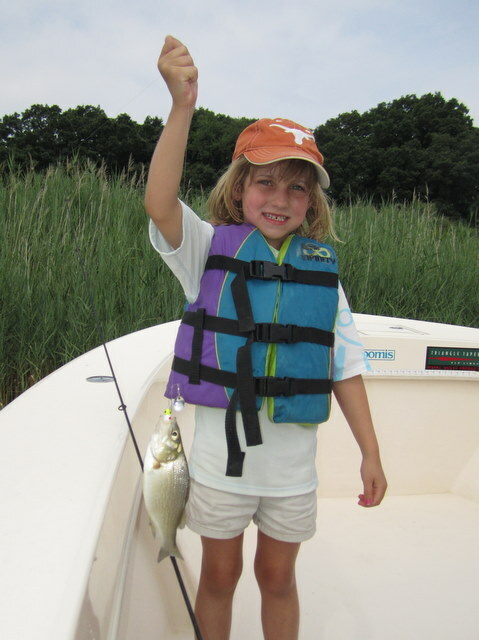 Matt Schneble, who with his wife and two children Jacob and Susannah were spending their July 4 weekend in Cambridge, decided a half-day fishing trip would be just the thing to cap off a fun-filled weekend. I met Matt and the kids at the free Cambridge city ramp on Franklin Street a little after 8:00 a.m. 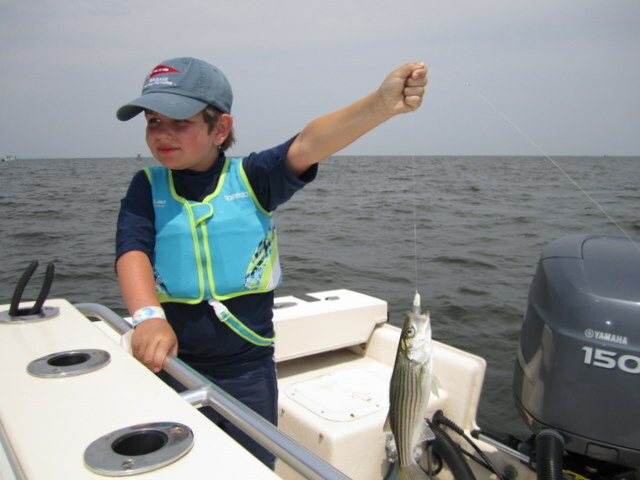 The waves were kicking up quite a chop, and not wanting to beat the kids to pieces on their last day of vacation we opted to fish for white perch around Howell Point. Jacob was the first to break the skunk and promptly brought to boat a nice perch. We were casting small Beetle-Spins and the kids were doing a good job casting and retrieving the small lures. It wasn’t long before Susannah got in on the action. 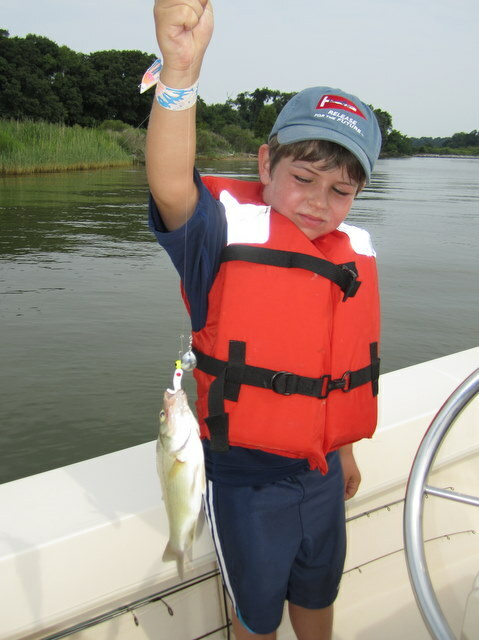 After a few more perch, Jacob decided it was time to try to catch a rockfish. Since the winds had calmed a bit, we stowed the ultra-lights and made our way to the mouth of the river. I looked around for some marks in a spot where I had done well about a week before and sure enough the fish were there. It wasn’t long before Jacob had caught his very first rock jigging a Bass Assassin. He was quite proud of that feat, as well he should be. Up in the bow of the boat Susannah was doing all she could to hang onto her G.Loomis and Shimano rod & reel combo, as a hard-fighting 20-inch rock was trying his best to take it from her. Susannah won the battle and boated the first and only keeper of the day. A couple of more drifts netted six or eight smaller stripers, with Matt also getting in on the act, before Dad decided it was time to call it a day. The kids did a great job and never gave up in some difficult wind conditions. Great job guys! Jacob with his very first rock! Whew! This should finally get me caught-up with the fishing reports. I know that I have been throwing a lot at you of late, but I hope the fishing (and writing) has kept your interest. Each season seems to bring a summer pattern slightly different from the last and this year is no exception. 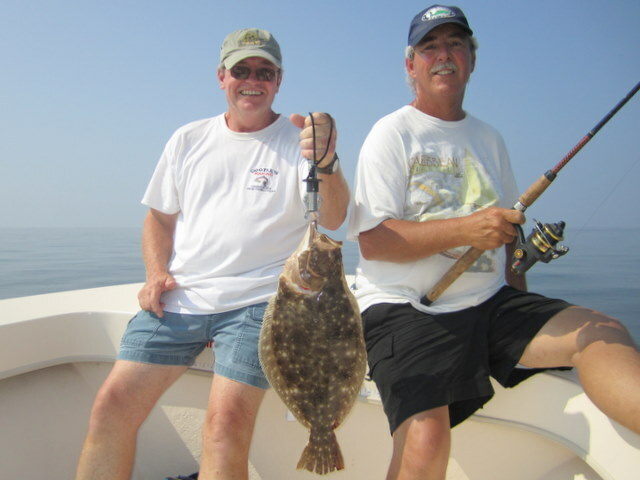 While last summer we had more bluefish to keep us entertained (we did have them earlier) that has been replaced this year with some excellent flounder fishing. On Wednesday, June 29 Michael Bievenour and Joel Davies joined me for a full-day trip out of Crisfield. 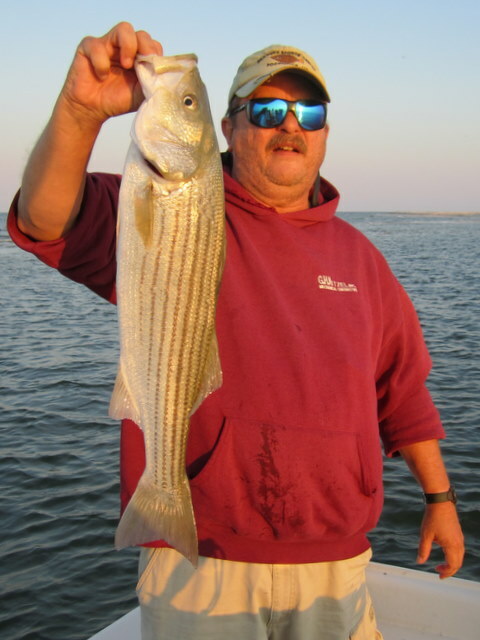 The routine was established – shallow water rockfish early and then off to the flounder grounds. I think we accomplished both feats, just maybe in reverse order. Mike and Joel spent the morning catching mostly small rockfish over some eel grass beds, as there was not much tidal movement to speak of. Since the striper fishing was slow to begin, we decided to try the flounder. 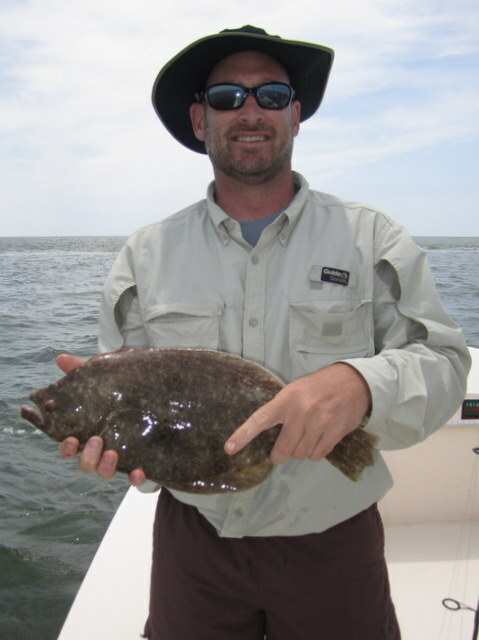 Due to windy conditions and a couple of trips to the mid-bay area, it had been a week since we last tried for flounder and I wasn’t quite sure what to expect. Not long after stopping at my favorite spot we had the first flounder flopping at my feet. 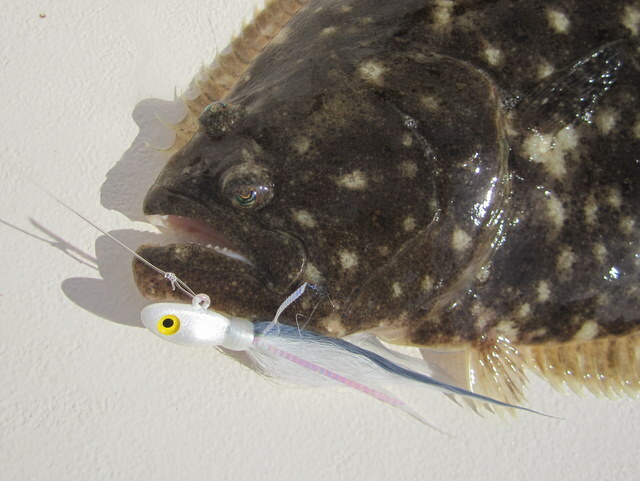 For the next couple of hours we had a steady pick of the tasty flatfish, the hook-ups coming just often enough to keep the guys senses on edge. As the wind dropped off and the tide changed we returned to a favorite rockfish hole. The fish were waiting for us. For the next hour or so, Mike and Joel battled stripers up to 25 inches casting plastic shads on 1/2 ounce jig-heads. Lots of fun on the feather-light G. Loomis spinning rods. It was a fitting end to a day with a somewhat slow start. I was always told it’s better to end the day on a high note and today I was fortunate. Good work guys! Saturday, July 2 brought back Crisfield resident David Wilmoth, along with friends Ron Long and Jim Daniel. David had mentioned more than once (good-naturedly, of course) that I was putting a lot of pressure on myself, what with all of the flounder photographs on my blog. He was right, of course. I knew one day it would come to and end – but today wasn’t the day. I’ll get to that in a minute. 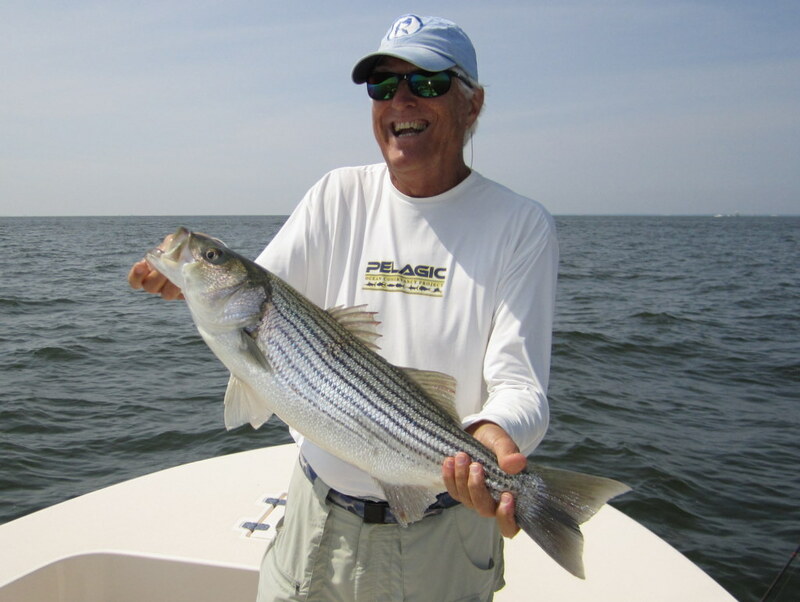 We started off with some early topwater rockfish action and before long we had six nice stripers boated, including a ten-pound fish caught by Ron. While the action was short-lived, the explosive strikes in shallow water made the early departure-time worthwhile. 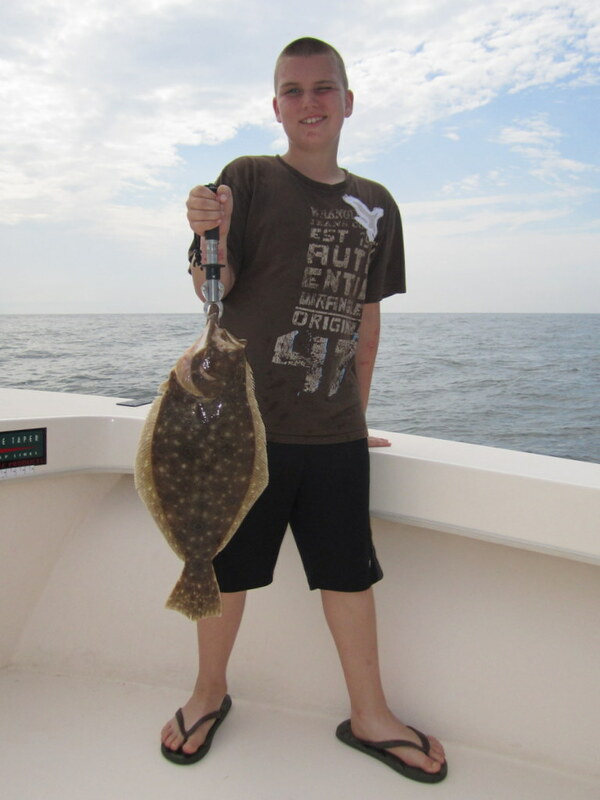 Now to the real reason David booked this trip – flounder! David told me he has been drooling (well, maybe my word) over my photographs of limits of big flounder, one of his favorite fish. He had me under the gun today and I was hoping the fish wouldn’t disappoint. We got to the flounder grounds a bit earlier than maybe I usually would and I am glad that we did. Being a Saturday, we had to share the spot with others; but aside from a boat or two anchoring in our drift-lane, all went well. And boy were the flounder up to the task. 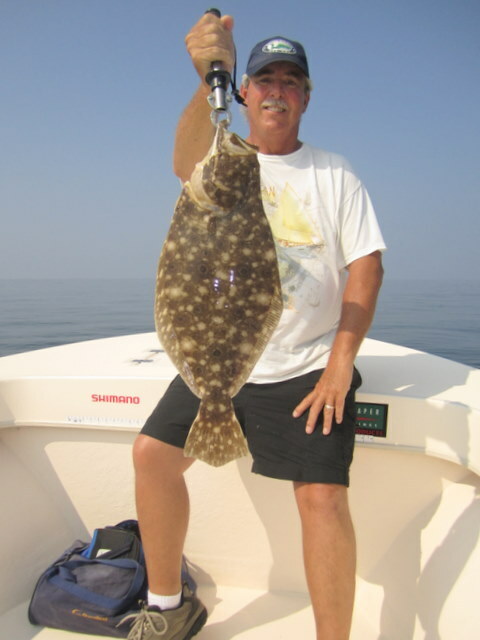 We had steady action, sometimes with double hook-ups, of nice flounder from 17 to 23 inches. In just a couple of hours the guys were able to box their limit of the tasty flatfish. A 3/4 ounce chartreuse bucktail with a 4″ Berkley Gulp! Swimming Mullet was the hands-down favorite this day. It seems the flounder have returned in force! We ended the day drifting the lower end of Pocomoke Sound feeding leftover Gulp! to small croaker, but no one really cared. The flounder had once again made the day and I hope I never wake up from this dream! Sunday, June 26 was a travel day for me – so to speak. 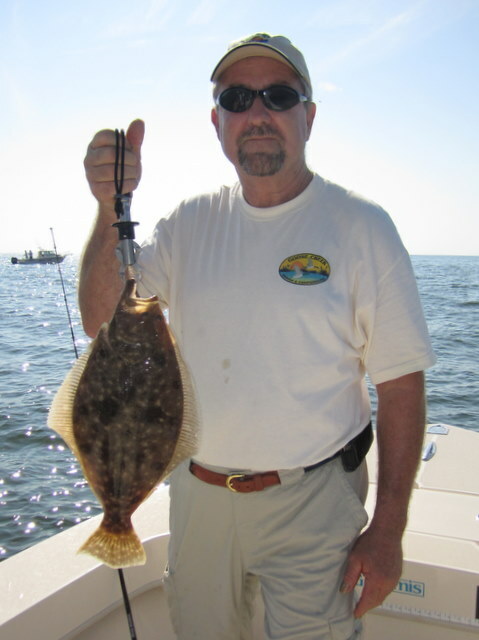 So far this season I have been spending most of my time fishing Tangier Sound out of Crisfield, mainly due to the fantastic rock and flounder fishing that we have been experiencing. 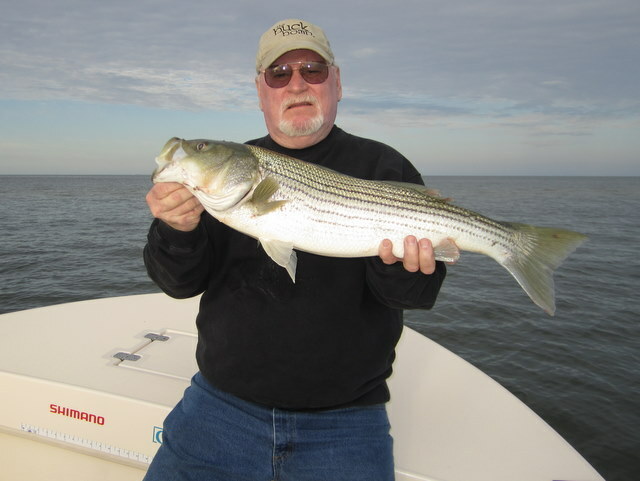 I had a request for a trip out of Oxford, on the Choptank River, from friend Jim Lee and his buddy from Florida Jim ‘Quiz’ Quisenberry who was in town for a little striper fishing. Seems rockfish are in short supply down in the Sunshine State. After launching at the free public ramp in Cambridge, I pointed the Jones Brothers downriver for the short run to the Oxford Ferry dock. After picking up Jim and Quiz we continued west towards Tilghman Island. Since the forecasted five knot winds were blowing at a brisk 15 to 20 out of the northwest, I decided to head through Knapps Narrows and begin the day fishing in the lee of Poplar Island. 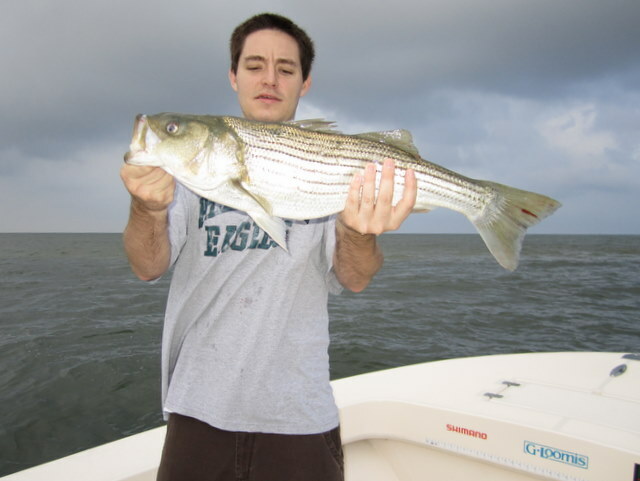 We spent the first hour casting to the rock out-crops on the eastern side if Poplar and Quiz was able to catch his very first striper, a fat 20-inch fish that went in the box for dinner. We drifted around some nearby trollers without success and proceeded to work our way south as the winds slowly subsided. Around mid-morning, as I was cruising an edge a few miles south of Poplar the screen of my Lowrance sonar unit lit-up with good-sized marks. We dropped our jigs and almost immediately hooked up with a nice grade of rockfish. For the next several hours we were able to stay with the school, all-the-while boating fish to 31 inches. Five-inch Bass Assassin Saltwater Shads and six-inch Storm Wildeye Shads were the ticket today. 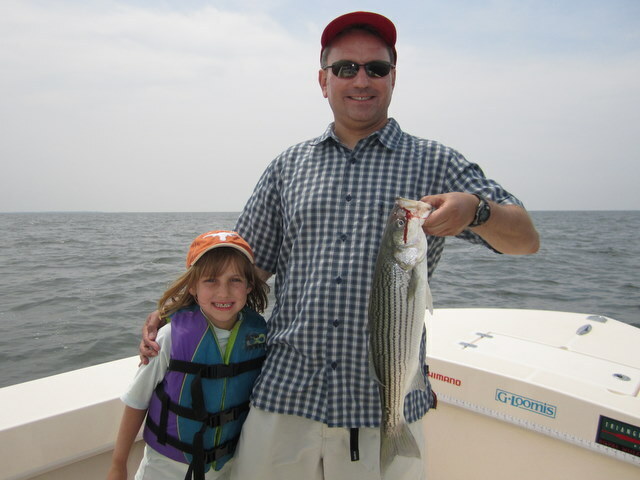 Quiz had a blast, and actually out-fished us Maryland boys on our home waters. The wind dropped off to nothing and gave us a much better ride in than we had coming out. Quiz having a blast with rockfish - We're not in Florida anymore! 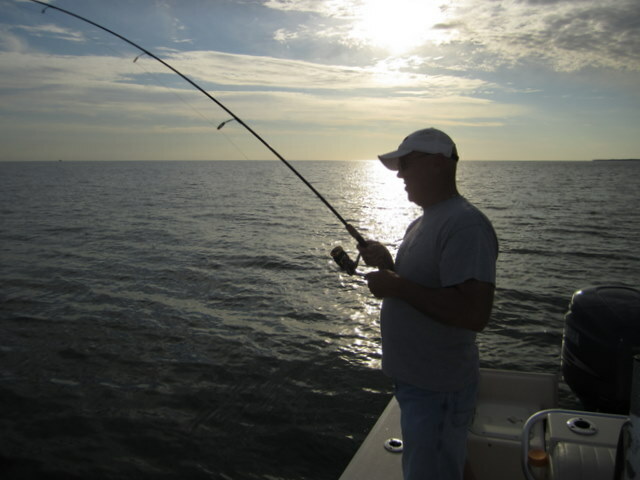 I absolutely love fishing the Chesapeake Bay’s lower eastern shore. 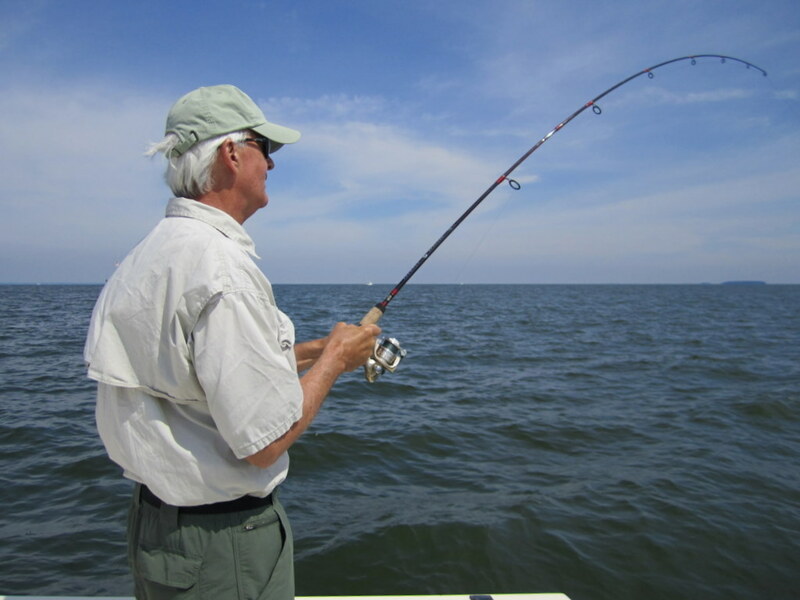 The shallow water fishery that we have here is, in my opinion, unequaled on any other portion of Maryland’s Chesapeake Bay. Acres of eel grass flats, underwater stump fields and wild marsh islands teeming with bird life all add up to an angling experience unlike any other. 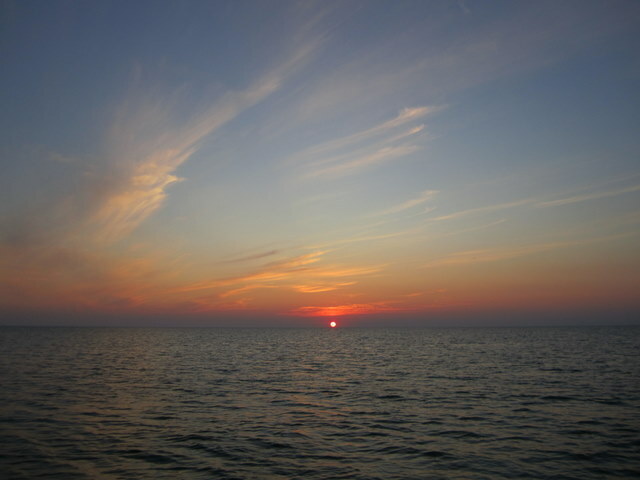 That said, there is one element that can quickly ruin the fishing on these shallow waters – the wind. Depths of six feet or less quickly become roiled by a stiff breeze, making it necessary to search in earnest for clean water. I always tell my clients that I look for several things when searching for fish; clear water, moving water (tidal current), baitfish, structure (grass, stumps, etc.) and deep water nearby. 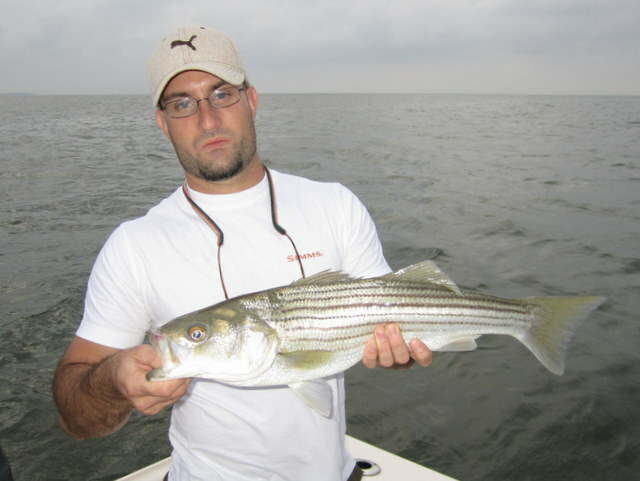 The deep water is not always necessary, but it helps when looking for bigger rockfish. Josenhans FF ~ Share a Trip for 1/2 the Cost! I’ve had a few requests from my regulars to share the cost of a guided trip. If anyone is interested in a cheap way to go fishing, please let me know and I will try to hook you up with a partner. 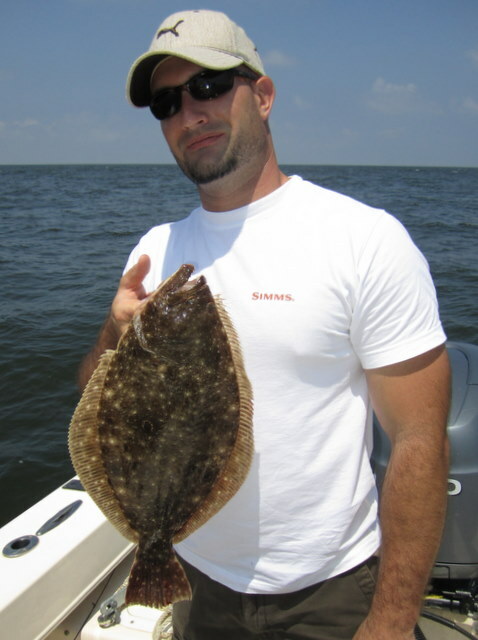 Early morning rockfishing is good and flounder fishing is great! We can do a 1/2, 3/4 or full day trip. Send me an email at kjosenhans@aol.com or call at 443-783-3271 if interested. Thanks! !